BUFFALO, N.Y. – I don’t think anybody expected the Massachusetts hockey team to be in the 2019 NCAA Division I National Championship game at the start of the season. Picked to finish sixth in Hockey East in the preseason poll, people expected UMass to be a tough out, maybe even a top-four team in the league, but big-time success was still years away, according to the experts. Cale Makar returning to the team as well as the rest of that coveted sophomore class, combined with a well-respected freshman bunch offered hope that maybe the Minutemen could squeak into the national tournament, if everything went right. Then they beat then-No.1 Ohio State, 6-3, in the second week of the season. Then they went undefeated in November. Then they were voted the No. 1 team in the country. Then they clinched their first ever regular-season title. Then they qualified for its first Frozen Four. And then they played in the national championship game. It didn’t end happily, but UMass still impressed many on its way to its best season in program history and established itself as an elite hockey club. 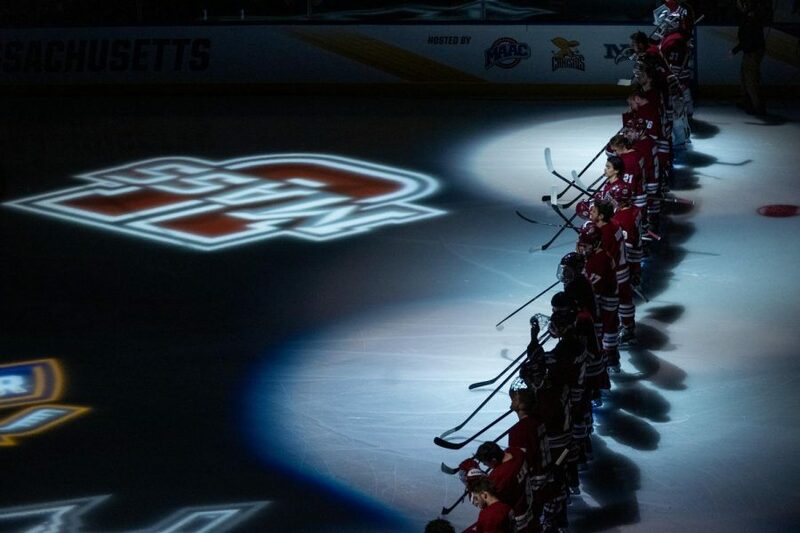 With much of the same squad returning next season, the Minutemen should be encouraged that this won’t be the last time they’ll be competing for college hockey’s holy grail. “Next year we aren’t done,” Mario Ferraro said. “We plan to be back here next year and redeem ourselves and win a championship not only here but also Hockey East. We have high standards here now. We definitely raised our standard of play and we still have goals to win a championship. We’re going to keep focusing on that. Coach Greg Carvel has preached since his arrival in Amherst about setting a new standard with the UMass hockey program. With a national championship runner-up to his name in just his third season, the Minutemen feel that standard has been set. The Bulldogs provide a perfect blueprint for who the Minutemen aspire to be moving forward. It stings right now, but UMass had a hell of a season. Winning 31 games isn’t a small feat. Winning the league title is a big deal and making it to the Frozen Four is impressive. The journey might be done for this year’s UMass team, but future Minutemen installments are in tremendous shape and this year’s team will be remembered as the one that changed it all. Wow.. the one sports team that actually wins and umass acts like they won the superbowl.